Cable has broken above some minor resistance on the hourly chart. 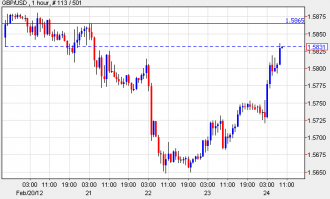 1.5852 is the downtrend from the recent highs and 1.5865 is the next minor resistance on the hourly chart. Scattered reports of offers but nothing major. EUR/GBP has bounced after a retrest of the European low at 0.8468.